Current Assets represents those assets which can be easily transformed into cash within one year. On the other hand, current liabilities refers to those obligations which are to be paid within an accounting year. Gross Working Capital: It denotes the company’s overall investment in the current assets. Net Working Capital: It implies the surplus of current assets over current liabilities. A positive net working capital shows the company’s ability to cover short-term liabilities, whereas a negative net working capital indicates the company’s inability in fulfilling short-term obligations. 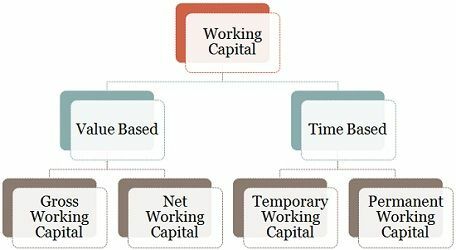 Temporary working Capital: Otherwise known as variable working capital, it is that portion of capital which is needed by the firm along with the permanent working capital, to fulfil short-term working capital needs that emerge out of fluctuation in the sales volume. Permanent Working Capital: The minimum amount of working capital that a company holds to carry on the operations without any interruption, is called permanent working capital. Other types of working capital include Initial working capital and Regular working capital. The capital required by the promoters to initiate the business is known as initial working capital. On the other hand, regular working capital is one that is required by the firm to carry on its operations effectively. 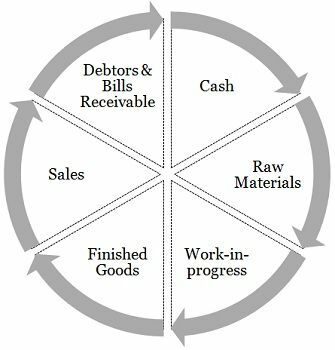 Working Capital Cycle or popularly known as operating cycle, is the length of time between the outflow and inflow of cash during the business operation. It is the time taken by the firm, for the payment of materials, wages and other expenses, entering into stock and realizing cash from the sale of the finished good. In short, the working capital cycle is the average time required to invest cash in assets and reconverting it into cash by selling the assets produced. The working capital cycle may vary from enterprise to enterprise depending on various factors, such as nature and size of business, production policies, manufacturing process, fluctuations in trade cycle, credit policy, terms and conditions for purchase and sales, etc.